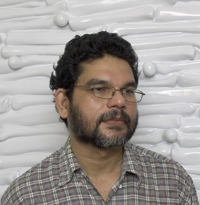 Employing the themes of war and global terrorism, South Indian artist T.V. 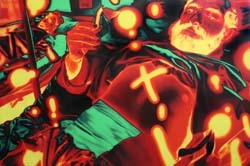 Santhosh paints in lurid greens and shocking orange, recreating the effect of a colour photographic negative. The artist charges his large canvases with figures in contoured and compromising positions. Like many of his politically motivated contemporaries, Santhosh lifts pivotal episodes from recent history and renegotiates their appearance with a shock-bulb of violent energy that eclipses the work. Santhosh’s paintings of impending doom, a world at the brink of an atomic end, are intentionally more apocalyptic than cathartic. Tracing an Ancient Error is an illuminated work of what appears to be a bearded man lain out, revealing his chest, holding onto something resembling a thread. An image from recent news events, Santhosh captures this scene and reinvents its value as a piece of anonymous and charged history. Santhosh has switched positive for negative colours in this work. 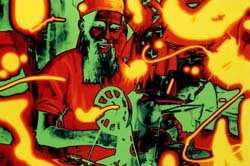 An aged man appears to be operating a sewing machine in a confined space. The artist riddles the surface with wisps of illuminated light that fall over the image like uncontrollable energy or an explosive force. Santhosh often borrows from news images in his works but in representing them through negative colours, suggests otherwise hidden implications to be surmised. Art Edge, presented by Fine Art Company, at National Gallery of Modern Art (NGMA), Mumbai and India Habitat Centre, New Delhi. Trans-Figuration, presented by ArtInc. At India Habitat Centre, New Delhi. Words And Images, organized by The Guild Art Gallery at National Gallery of Modern Art (NGMA), Mumbai. Quotable Stencil, Tao Art Gallery, Mumbai. Creative Space, organized by Sakshi Gallery at India Habitat Centre, New Delhi.